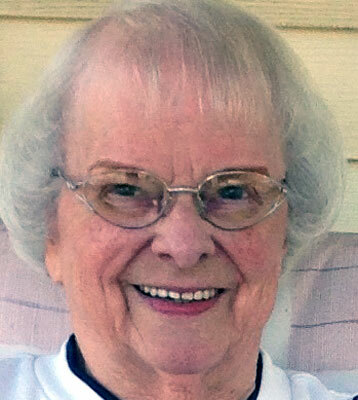 MCDONALD - Betty Jean Moody O’Connell Bilger passed away on Aug. 11, 2015, at home, in the peaceful comfort of her faith and family. Betty was born in McDonald to Benjamin and Emma Shaw Moody. She graduated from McDonald High School in 1946, a member of the “Seven Angels,” and has remained true to her school and community, generously supporting the MHS alumni fund. She found spiritual fulfillment at Our Lady of Perpetual Help Church. Through her professional career as a medical assistant, she orchestrated office operations, first for Drs. Brown and Baumblatt and, most recently, for Drs. Mikolich and Nicoloff, and teamed with her husband in support of her true passion, her family, for whom she gave her all and from whom she drew her strength. When not nurturing a family calling, she vanquished innumerable New York Times crosswords, read avidly, and fervently supported the Blue Devils, Buckeyes and Browns. Betty was predeceased by her parents, Benjamin and Emma; her brother, Benjamin; her sister, Becky; her first husband, Harry O’Connell Sr.; her second husband, Donald Bilger; one son-in-law, James Bowser; one granddaughter, Sonja O’Connell; and one great-grandson, Zeke Bowser. She is survived by her daughter, Rita Bowser; her sons, Patrick (Maureen) O’Connell, Harry (Georgia) O’Connell, and Michael (Sheryl) O’Connell; a stepdaughter, Kathy (James) Patitucci; 10 grandchildren; and 21 great-grandchildren. A Mass of Christian Burial will be held on Saturday, Aug. 15, 2015, at 10 a.m., preceded by a prayer service at 9:30 a.m., at the Blackstone Funeral Home. Family will receive relatives and friends on Friday from 6 to 8 p.m., at the funeral home. In lieu of flowers, donations may be made to Hospice of the Valley. Please share your memories of Betty J.